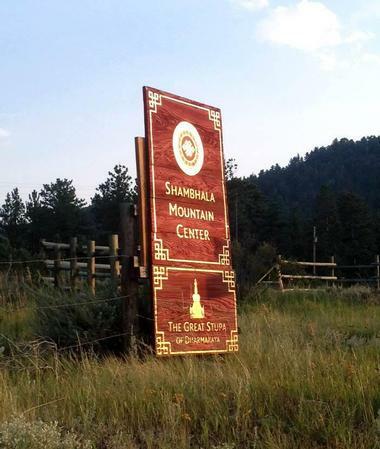 The Shambhala Mountain Center is a non-profit organization whose mission is to create a space for the ‘exploration of individual and social wisdom'. Located 8,000-feet above sea level in Red Feather Lakes, northern Colorado, the 600-acre retreat is nestled among mountain valleys, woodlands and meadows, which is an oasis away from the hustle and bustle of everyday life. 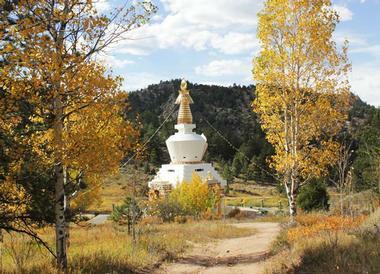 Located some 50 miles northwest of Fort Collins, visitors can head to the Shambhala Mountain Center for a general visit, attend a retreat or simply to relax in the tranquility of Mother Earth. The inside of the stupa is being divided into three levels. The first level, which is open to the public, is a 33-square feet assembly hall that houses a 20-foot high golden statue of Buddha. The skull relic of the center’s founder Trungpa Rinpoche is found inside the statue. The hall was designed as a place for mediation but is free for the public to entry. It can be reached via a 20-min hike from the main parking lot. 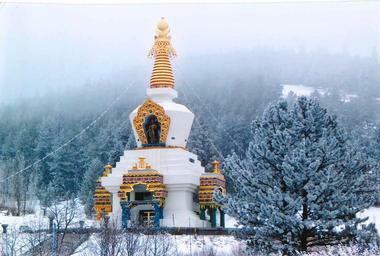 Surrounding the main stupa are various altars, including one that is dedicated to the founder and another to Dalai Lama who visited the center in 2006. 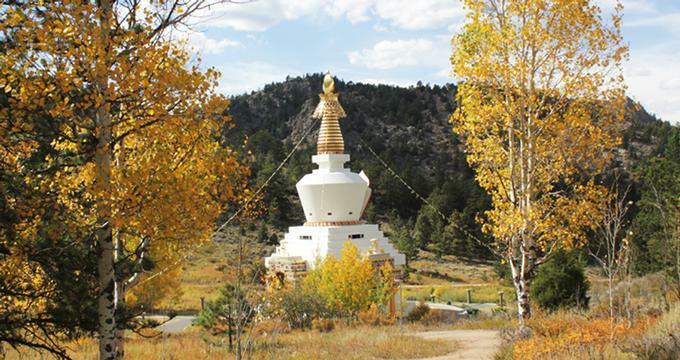 From the stupa, which is located on the upper end of Shambhala Mountain Center’s main valley, visitors will be treated to panoramic sweeping views of the surroundings and be grounded in the present moment by the beauty of nature. As a retreat center, there are a variety of accommodation options that is inclusive of meals. 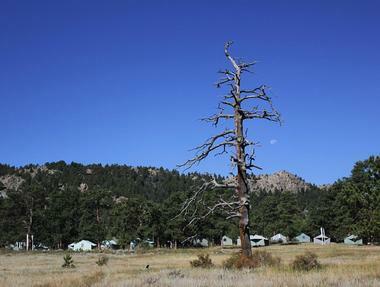 Two of them are the lodge and the rustic Red Feather campus, with a total capacity of up to 150 participants. The ensuite single and double bed rooms are furnished with full-sized beds and outdoor patio for relaxing. Other more affordable options would include lodge rooms with assigned roommates and same-gender dormitories. During warmer months, single and double tents are available at the campground. Bedding is self-provided and visitors will have to share bathrooms. As for catering, three buffet-style meals are made available every day at the dining area that provides vegetarian, vegan and gluten-free options. Throughout the day, visitors will also be able to enjoy unlimited refills of coffee, tea and bread. Spanning over 600-acre, there are five venues onsite to host large groups and meetings set in a serene atmosphere. The Sacred Studies Hall fits up to 150 people and is a unique place to host your guests. Featuring bamboo floors and a zen garden, the hall emanates a sense of tranquility and peace that is calming and inviting. There is an adjacent kitchenette for preparing tea/coffee and snacks. The Summer Conference Tent is available only from June to September and could accommodate retreats of up to 450 people. The tent is pitched on a wooden platform and comes with zipper windows to let in breeze or protection from rain. Audio-visual equipment is also available. Back to: Best Spiritual and Yoga Retreats in the U.S.